If you've ordered Boomtown Fair 2017 tickets and are patiently waiting for the big event, you'll probably be wondering where your tickets are, right? Fear not! Here's a handy guide including everything you need to know about getting your tickets and how to update your information. When should I receive my tickets? Tickets have started sending from our system and are making their way into your email inbox this week. Please wait until Monday (19th June 2017) if you've still not got them to contact us (contact info below) as these things can take a little while to generate and send. I've only had some of my barcodes come through, why is that? If you've got a particularly large order or if you've got more than one order, it's highly likely that you'll get your barcodes on separate emails. If this is the case, hold tight and wait for your other barcodes to come through on another email. How do I change the names or information on my tickets? For most tickets, you are able to update the ticket holder details at any time before the event (we suggest doing this a few weeks before the event). If you need to change any of these details, log in here and click the 'Boomtown Fair 2017' link in the big green box. In here you'll be able to update your ticket holder information. Once you've updated this information you'll get a new email with the updated barcode tickets on. Again, this can take a little while to send so please allow 48 hours for this to come through. P.S. Not all tickets can have the name changed on them, if in doubt, log in and if you are prompted you can change them. My ticket says 'MD', what do I do? This means your tickets are missing data and we need some information before we can send you your tickets. 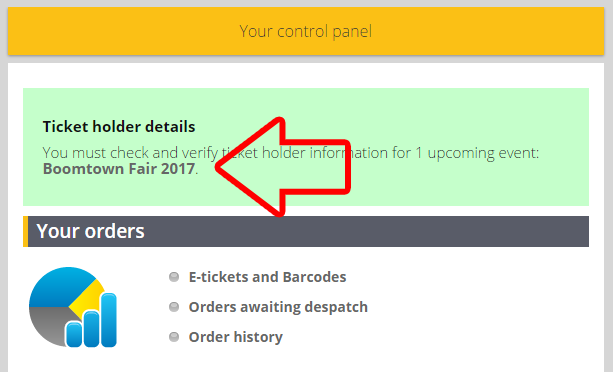 To fix this, follow the instructions above on how to change the names or information on your tickets. What should I do if I've still not got my tickets? You can login and download your tickets from your account on TheTicketSellers website at any time. To do this, simply log in here and click 'E-tickets and Barcodes'. In here you'll see a list of your tickets and if they're ready for download click on the 'PDF Download' button. If they say 'Not generated' keep waiting until Monday (19th June 2017) as this means they're still working their way through our system. If by Monday (19th June 2017) they're still not showing on your account and you've not received an email with them on, pop us an email (info@theticketsellers.co.uk) and we'll get them resent to you. For even more information, please take a second to read Boomtown 2017 - The Essential Guide. If you have any other questions about your tickets, please get in contact with us and we'll be happy to help.